There is an independent Pre-School that hires our facilities and holds sessions every morning in our Dining Hall. As Charlwood Pre-School is not a part of Charlwood Village School it may not run on the same term time dates. There is no admission link between the pre-school and the school and therefore does not guarantee a place in our Early Years class. 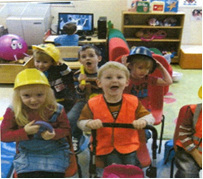 Charlwood Pre-School provides a safe, friendly and stimulating environment for children from the age of 2.5 years. It is managed by a committee consisting of parents who employ a team of well qualified and experienced staff to implement The Early Years Foundation Stage curriculum specified by the Department for Education and Employment (DfES). All activities are "play" led so children enjoy the various resources that help with their personal development. Each term follows a "theme" to consolidate the learning experience and provide the widest possible foundation for your child's future learning.Parents receive a "Pre-School Report" on the progress and achievements of their child when they leave to attend Infant School. Supervisors and Keyworkers welcome parents and carers input and regular discussions on individual child development are encouraged.